[142 Pages Report] The data discovery market size is estimated to grow from USD 4.33 billion in 2016 to USD 10.66 billion by 2021, at a Compound Annual Growth Rate (CAGR) of 19.8% from 2016 to 2021. Major growth drivers of the data discovery market include increasing importance of data-driven decision-making, growing trends of self-service Business Intelligence (BI) tools, and insight generation from a growing number of multi-structured data sources. The adoption of data discovery for asset & liability management, budgetary control management, general ledger management, payables & receivables management, and profitability management are some supportive factors accelerating the growth of the market. Organizations have more access to data than ever before and are working to optimize it to make better business decisions. However, many companies are still struggling to translate insights created by data analysis into data-driven decision-making. Data discovery provides tools to help ingest data from various disparate sources and then scrutinize them using a graphical interface to find patterns & trends to promote sensible decision-making capabilities. Further, this is growth is additionally fueled by increasing global competition to optimize the operations to reduce the overhead costs and drive the profit margins, so are leaning towards the advanced BI tools for data discovery such as self-service data discovery to leverage technology advancements. 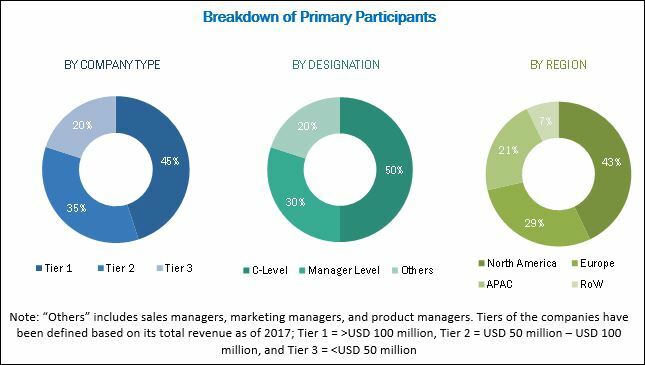 During this research study, major players operating in the data discovery market in various regions have been identified, and their offerings, regional presence, and distribution channels have been analyzed through in-depth discussions. Top-down and bottom-up approaches have been used to determine the overall market size. Sizes of the other individual markets have been estimated using the percentage splits obtained through secondary sources such as Hoovers, Bloomberg BusinessWeek, and Factiva, along with primary respondents. The entire procedure includes the study of the annual and financial reports of the top market players and extensive interviews with industry experts such as CEOs, VPs, directors, and marketing executives for key insights (both qualitative and quantitative) pertaining to the market. The figure below shows the breakdown of the primaries on the basis of the company type, designation, and region considered during the research study. The Major vendors that offer data discovery offerings globally are Tableau Software (U.S.), TIBCO Software (U.S.), SAP SE (Germany), SAS Institute (U.S.), Cloudera (U.S.), Birst (U.S.), Datawatch Corporation (U.S.), Oracle Corporation (U.S.), Datameer, and Clearstory Data (U.S.). These vendors adopted different types of organic as well as inorganic growth strategies such as new product launches, partnerships & collaborations, and mergers & acquisitions to expand their offerings in the data discovery market. In December 2016, Oracle Corporation started providing its analytics solutions through cloud environment. The company has taken this step to deliver its analytic solutions such as data preparation, data discovery, and visualization at lower costs. In August 2016, Tableau entered into a collaboration with Narrative Science, the leader in Advanced NLG. The collaboration would provide a free Chrome extension that automatically creates written explanations for Tableau graphics which helps discover and convey relevant information in conversational language, which people can easily comprehend. In February 2016, Datameer launched its APAC operations by setting up teams in Hong Kong and Singapore. With strong growth in North America and Europe, the company has been focusing to enter this untapped market. .
What are new application areas which the data discovery companies are exploring? 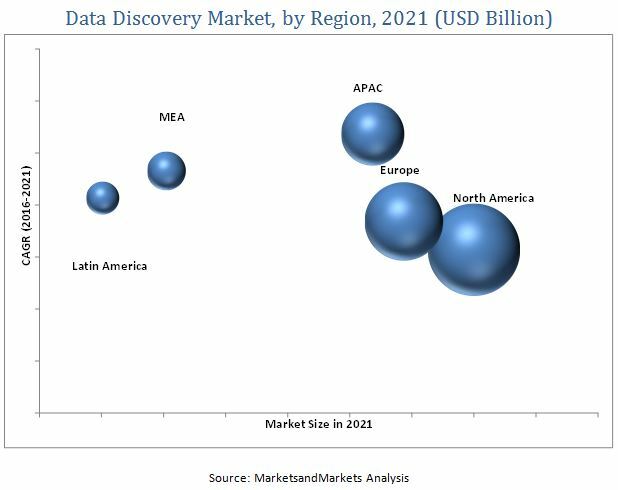 The data discovery market size is estimated to grow from USD 4.33 billion in 2016 to USD 10.66 billion by 2021, at a Compound Annual Growth Rate (CAGR) of 19.8% from 2016 to 2021. The report segments the market into component, deployment models, organization size, applications, verticals, and regions. 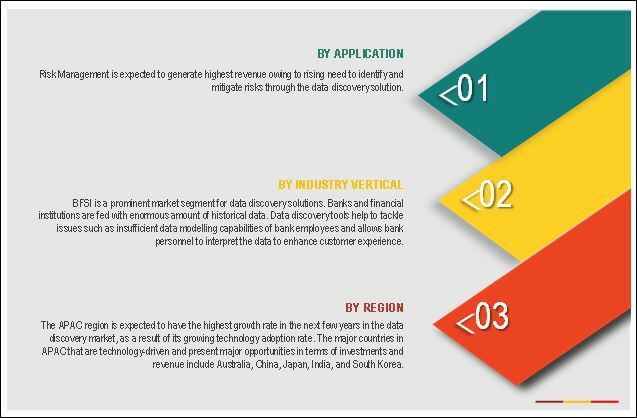 Major growth drivers of the data discovery market include increasing importance of data driven decision making, growing trend of self-service BI tools, and insight generation from a growing number of multi-structured data sources. The rising need for data driven decision making and understanding undiscovered trends and pattern has made data discovery as a hot topic on both business and IT sides of organization. Data discovery can contribute significantly towards interpretation and sharing of insights from data analytics, enabling non-technical SMBs to perform data discovery in a self-directed manner. Implementation of chart diagrams and maps, the growth in the number and variety of visualizations available in graphics libraries are supporting advanced visual analysis, allowing companies to go beyond simple bar and pie charts to express more advanced insights about quantitative information. Data discovery platform is a user-driven process and a part of business intelligence architecture mainly aimed at creating interactive reports and exploring data from various back-end systems and sources for searching for patterns or specific items from the data set. Data discovery software and services are gaining traction attributed to increased need of the voluminous data getting generated in organizations on a daily basis. The data discovery market on the basis of application is segmented into risk management, social network analysis, customer experience management, cost optimization, supply chain planning and optimization, sales and marketing optimization, asset management and others. As finance sector is highly volatile financial environment, identifying and managing risks have become a critical risk for organizations with their complex network and global operating models, thus it is estimated to have the largest market share during the forecast period. With new growth opportunities declining in conventional, strong markets such as North America and Europe, a majority of vendors are showing an interest in the APAC region. The major countries in APAC that are technology-driven and present major opportunities in terms of investments and revenue include Australia, China, Japan, India, and South Korea. The companies operating in the APAC region will benefit from the flexible economic conditions, industrialization- and globalization-motivated policies of the governments, as well as the expanding digitalization, which is expected to have a huge impact on the business community in the region. Other countries such as Singapore, Hong Kong, Indonesia, and Malaysia are looking forward to integrate new technologies into their businesses. Data discovery can be defined as a decision-making platform to assimilate, structure and refine data obtained from stored and streaming data sources. A data discovery platform provides tools for traditional On Line Analytical Processing (OLAP) capabilities and easy-to-use data science capabilities for less experienced users. Data discovery products also provide a wide array of analysis techniques, which include statistical analysis, text analysis, and graph analysis, which can be considered as the major factors for the growth of the data discovery market. Data discovery tools help to tackle issues such as insufficient data modeling capabilities of bank employees and allows bank personnel to interpret the data to enhance customer experience. It helps to identify potential customer segments and trap them with effective offers. More significantly, data discovery is beneficial to banks and financial service providers to build business models and take proper investment decisions with substantial risk analysis. Growing penetration of online shopping among consumers have fueled the growth of the e-commerce sector across the world. Such e-commerce players have tremendous customer data collected over the years with constant addition of petabytes of data every day. The data collected through social media in the form of comments, posts, and blogs prove helpful to make demand forecasting, customer segmentation, and profitability analysis. Data discovery tools help the telecom companies to view customer experience and satisfaction independently across each channel. This facilitates them to calculate prices and build marketing plans of new services, improve average revenue per user, enhance customer loyalty, and minimize loss. Customer retention and acquisition with data analysis is one the major focus areas for telecom companies, as they can develop effective marketing campaigns and product offerings. Manufacturing companies seriously focus on analyzing the data collected from numerous sources, including historical production data to sensor signals, to identify production, labor, product quality issues and address them in the minimal time efficiently. The manufacturing industry is recognizing the benefits of data discovery tools and has started implementing the solution in various processes. What are the upcoming industry applications for data discovery market? The rise in data has given rise to diverse data sets, such as structured and unstructured data type, which are not properly examined by the traditional data discovery methodologies and hence, the investors are not able to make complete use of the data to fetch desired information. Organizations are using the traditional BI tools for data discovery, as they are unaware of alternative solutions which are efficient and can help organizations increase revenue. These limitations faced by organizations, due to lack of skilled workforce and outdated technologies are resulting in their lower RoI. Major vendors that offer data discovery offerings globally are Tableau Software (U.S.), Datawatch Corporation (U.S.), TIBCO Software (U.S.), SAP SE (Germany), Datameer, Inc. (U.S.), Qlik Technologies (U.S.), and ClearStory Data (U.S.), These vendors adopted different types of organic as well as inorganic growth strategies such as new product launches, partnerships & collaborations, and mergers & acquisitions to expand their offerings in the data discovery market.